Bob's Blog: "There is no viable Semi-Detached-from-Trump party." "There is no viable Semi-Detached-from-Trump party." 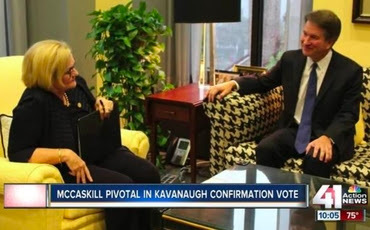 He's here, she's gone: Brett Kavanaugh with one of the kamikaze Democrats who voted against him, Clare McCaskill. Yes, "suburban women" are antipathetic to the President, but it is nevertheless a fact that there's a Democrat party and a Trump Republican party but there is no viable Semi-Detached-from-Trump party. Two years ago, when Democrats and celebrities started yakking about boycotting the inauguration, Trump should have moved the ceremony to a simple swearing-in by whatever judge or justice of the peace was to hand down on the southern border, followed by a ceremonial laying of the first brick of the Trump Wall. He was not elected to be a conventional president, and the conventional types - the bureaucracy, media, Ryan - were determined to obstruct him from Day One. Trump was stiffed by his own party on, inter alia, Obamacare - which, insofar as the Dems had an issue last night, was a biggie. He's not going to get much legislation with a Pelosi House, but he didn't get much with a Ryan House, did he? So the Wall is either dead, or will have to be accomplished via some artful sidestep, such as devious re-purposing some funds deep within Homeland Security or the Pentagon or wherever, and taking the heat from whichever twerp District Court jurist strikes it down. The Senate, unlike the House, at least confirms judges and cabinet officials. If the GOP gets to 54 or 55 seats, it's thanks to Trump, and he should take advantage of it to do some re-jigging of the team. Moving Jeff Sessions to Homeland Security and Kris Kobach into Justice wouldn't be a bad start. ~Speaking of waves (at least with respect to the Florida coast), I'm relieved about the Sunshine State races, and not just because Senator Bill Nelson with his peculiar rictus grin was one of the most ridiculous of the podium grandees on the day I testified in Washington on climate change. Nelson a-huffed and a-puffed on how there was water in the streets of Miami Beach. Well, I said, why not do what the Dutch coast and the Thames Estuary and St Petersburg (Russia) have done and build a flood barrier? That's a few million bucks, and it's up and running in a few years. Whereas attempting to re-set the thermostat of the planet will do nothing for water in the streets of Miami Beach. Alas, taking focused local action doesn't offer Senator Nelson as many opportunities for planet-saving virtue-signaling. So good riddance to him, and we'll see how his opponent, Rick Scott, fares in Washington. The Washington Post has certainly got the goods on the GOP's Ron DeSantis - because he made the mistake of attending a conference whose speakers included ...um, me. So last night was an important result. Association with Steyn is not necessarily fatal to political viability. ~Colorado elected the first openly gay governor, but Vermont declined to elect the first transgender governor. I'm bored with all these supposedly historic "firsts" - as I said to a Dem activist on "Tucker" a couple of months back, where's the first Muslima transgender? Yeah, okay, maybe I scoffed too soon: Kansas did manage to elect the first lesbian Native American ex-MMA fighter. But I do think that, if you examine the margins in the other statewide races, it's not unreasonable to posit an intriguing hint of "transphobia" among Green Mountain Democrats. That's an interesting glimpse of the limits of identity politics.